This is about the ATV. For the personal watercraft, see Yamaha blaster. The Yamaha Blaster is a 200 cc air-cooled single-cylinder two-stroke all-terrain vehicle produced as an entry-level machine manufactured in Japan and sold in the United States from 1988 to 2006. Because of the Blaster's initial low price tag, it sold in large numbers for many years. Its two-stroke engine is easily modified by enthusiasts and a large aftermarket now exists for the quad. A range of add-ons are readily available from simple bolt on exhausts and suspension parts to complete aftermarket frames and larger displacement engines. The heavily finned, air-cooled Blaster engine has roots from a water-cooled machine, as evidenced by the plugged water pump casting on the right side of the engine. The history of the engine in its water-cooled form can be traced directly back to the RD/RZ125 lc (shares an identical bottom end and crank cases but uses a different stroke crank) and the Australian market WR200. It is possible to use parts from either of these bikes and build an all-Yamaha water-cooled Blaster engine, or one can simply swap the engines since the engine mounts are nearly identical. In 2002 there was a minor change of the rear tail light to a multi-function tail light and brake light. For the 2003 model year the Blaster was updated with a re-styled front nose, and the headlight assembly was moved down from the handlebars to the nose, and an all around lighter machine for greater performance. The problematic mechanical rear and front drum brakes were replaced by dual hydraulic disc brakes in both the front and rear. Because of U.S. government emissions requirements, the Blaster was discontinued for 2007 and was replaced by the entry-level Yamaha Raptor 250, which uses a cleaner-burning, less powerful four-stroke engine. The Blaster is closer in performance to the Yamaha Raptor 350. 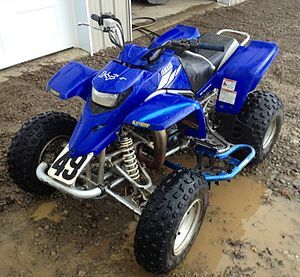 The Yamaha Blaster's production was stopped in 2006 and its successor is the Yamaha Raptor 250, the Yamaha Raptor 250 is a beginner fourwheeler meant for people who aren't as experienced. This page was last edited on 1 January 2019, at 01:16 (UTC).